(or even my photoShop skills, LOL). as most know, composing words is much more time-consuming for me now. A blog entry has increased to usually between 6 and 12 hours. Having problems even composing brief replies to my dementia friends on social media. i know i want to say something. in a way that shows i understand how they are feeling. … but i cannot find words. If husband is home then i will call him over and ask for his help composing the words. if husband is not home, i now have quite a selection of pictures i have put together. I try to find the picture that matches my feelings best, and just send the picture. Or i might take the opportunity, and spend an hour or two composing a new picture. … and need pictures to “speak my mind”. my dementia friends frequently just send a picture. No words, just a picture of an animal or flowers, etc. That shows i am not alone in this challenge ((smile)). then found i had already started another entry with the same title. i suspect this is how i began my selection of pictures. So also attaching it here. or what pictures i am talking about attaching). Gonna leave this paragraph as “trigger” for possible future remembrance. * Admin issues: SHARE dementia awareness thru buttons below. Feel free to leave your thoughts in the form of comments, but please filter your comments with truthful loving kindness to all concerned. If interested in receiving notice of future blog postings, subscriptions are available through a “follow” button in the upper left corner (MS Explorer) or lower right (Safari, Mozilla Firefox and Chrome). If there is an advertisement below, I have no control over what is shown. My own full legal name is Truthful Loving Kindness. My current diagnosis is still Mild Cognitive Impairment, but my neurologist said I am in a unique position for helping because I have “one foot in each door”. Text Copyright © Truthful L. Kindness 08Apr2019. 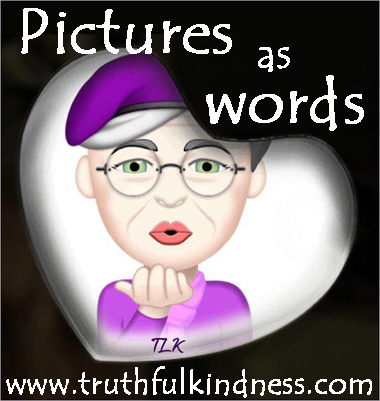 Tags are: communication, dementia, pictures, PLwD, verbal, visual, words, writing. This entry was posted in Arts n Crafts, Communication, Crucial, Dementia Symptom Tips, Important, Journal, Relationships, Symptoms and tagged communication, dementia, pictures, PLwD, verbal, visual, words, writing. Bookmark the permalink. Lovely to know that you follow our posts, whatever type of response you give. Take care, True. i appreciate your positive outlook and candor with the turmoil of Life. No longer able to follow every blog entry on everyone’s blog , but definitely try to keep in touch on FaceBook.